In 1995, on what would have been Selena’s 24th birthday, then Governor of Texas George W. Bush declared April 16th, Selena Day. This Throwback Thursday, let’s look at the legacy Selena has left in the years since her death. Selena was, and will remain one of the most beloved woman in the Latino community, second only to the Virgin Mary of course. At the age of 23, Selena was murdered by Yolanda Saldivar (arguably the most despised person in the Latino community), but somehow even twenty years after her death, Selena’s brand continues to thrive. Credit can largely be given to her father (Abraham Quintanilla), her sister (Suzette Quintanilla-Arriaga), and her brother (Abraham Quintanilla III also known as “A.B.”), who have dedicate their lives to preserving her legacy. Music artist have come and gone since her death, but what was it about Selena that managed to capture the hearts of so many loyal fans? Millions of Latinos could easily related to Selena’s bicultural life, she had a broad appeal among Latinos and non-Latinos. Her music drew from pop, Tejano, calypso, Afro-Caribbean, and cumbia musical genres, and this fusion won her a wide and lasting fan base. Selena’s relatability was widespread; she not only appealed to young generations but also to the older ones. She was a singing sensation who could sell out stadiums but still lived modestly in a home next door to her parents. Coined “The Mexican Madonna,” she dressed provocatively in bedazzled bras yet married her first and only boyfriend. She was a person that young girls could idolized and inspire to be like, a far cry from current pop stars like Miley Cyrus (some might say). But Selena is not just a performer, she has become an “icon.” Like other celebrities who passed away too soon, Selena has become larger than life, legendary. Her album, Dreaming of You (1995), released posthumously became the fastest-selling album by a female artist in pop history, and the film about her life Selena (1997) made Jennifer Lopez a star. Since then, several books, a record-breaking tribute concert, and two stage musicals have supplied audiences with new material, along with a plethora of merchandise ranging from shirts, hats, and posters to koozies and dolls. Selena changed the way marketers looked at Latinos. Her death was a revelation to corporate America about the power of the Latino consumer market. 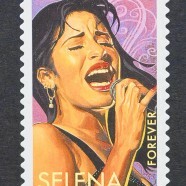 In the aftermath of her passing, People Magazine released a special edition devoted to Selena, and it sold out immediately, leading to the creation of People en Español. Her powerful influence over the Latino community has not subsided over the years, and it remains a force to be reckoned with. Recent news of a holographic concert tour and rumored line of products with MAC cosmetics has the hearts of girls everywhere (including my own) singing bidi bidi bom bom. Public fascination remains as many fans continue to make the pilgrimage to her hometown of Corpus Christi, Texas to submerge themselves in all things Selena. Similar to the JFK assassination, ask any Latino where they were when they found out about her death and they can probably give you an answer. Selena is and will forever remain a beloved figure in the Latino community.